Get ready for thrilling action and adventure with Jurassic World! Relive captivating movie moments and exciting scenes with this line of film-inspired products featuring authentic detail, amazing design and incredible value fans will love! Activated by the full-function RC control, this quadcopter Pterano-Drone has an operating range of approximately 25-feet that lets fans go to new heights and experience high-flying movie-inspired fun! 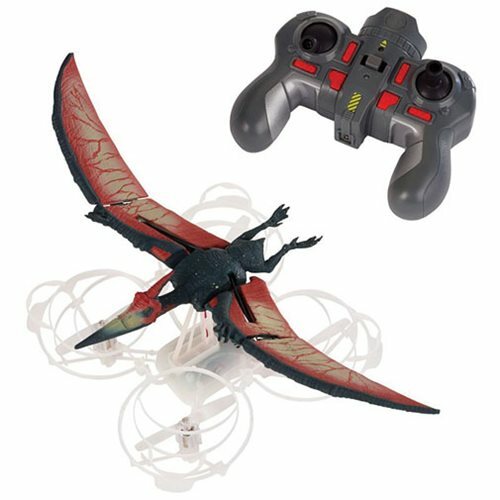 When operated by the hand-held remote control and in the air, the Pterano-Drone moves like a realistic Pteranodon with actual wings that flap—bring the drone and movie-inspired action to life! Circle your prey in Auto Circle mode and then swoop in on the prey in Auto Land mode to land. Experience unlimited ways to bring Jurassic World to life and act out exciting scenes from a whole different vantage point!